Zomato initially named as Foodiebay was started in 2008 by Mr. Deepinder Goyal. It is a restaurant searching platform providing in-depth details with autonomous reviews and ratings. Foodiebay, the initial name was changed to Zomato in November 2010 to increase their reach among people. To differentiate themselves from their competitors, Zomato concentrated on adding approx. 18,000 new places to eat from. Along with they also decorated many special features, such as pointed to particular dishes or opening times”. To be the largest resource in food supply market, Zomato bought urbanspoon, a leading restaurant service providing portal for $52 million to enter US, Canada and Australia to leverage local insights and experience and to expand their business in overseas seeing the future goal and objective. Number of listed restaurants: in 2008 it was 4000 restaurants which increase to 94000 in 2013 and currently 384,100 in Q1 of 2015. 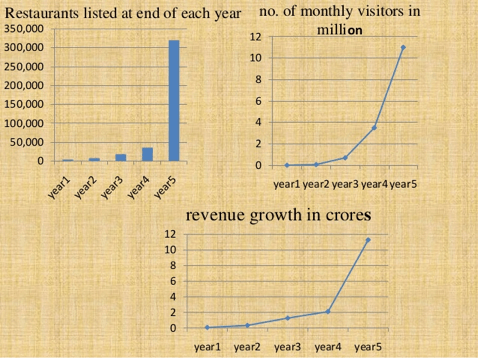 Monthly visitors of Zomato increases to 35 million in 2014 which was 11 million in 2013 and 0.015 million in 2008. Yearly revenue of Zomato in 2008 was 0.06 crores which increased to 11.3 crores in 2013. Spread in 21 countries worldwide. Integrating other tools in their marketing strategy has given them wonderful hike in their business. In August 2010, Zomato got its first round of funding of $1million from Info Edge, India. And in September 2011, got its second round of funding of $3.5million from the same financier. Next year Zomato upraised its third round of another $2.5 million from the same investor and again in early 2013, Info Edge funded fourth round worth $10 million which gives them a 57.9% stake in Zomato. Seeing the future and growth of Zomato, Sequoia Capital and Info Edge, India in November 2013 funded Zomato with $37 million. Info Edge now owned 50.1% of Zomato on an investment of INR 143 crores. The total funding raised by Zomato till November 2013 stands at $53.5 million. In November 2014, Zomato came up with a fresh round of funding of $60 million at a post-money valuation of ~US$660 million. This round of funding was jointly headed by Info Edge India Limited and VY Capital, with involvement from Sequoia Capital. This made a total funding of over US$113 million for Zomato. Recently in a fresh round of funding in April 2015, Info Edge, India has invested an amount of Rs 155 crore in Zomato. Info Edge said in a statement “Being Info Edge’s fair share of Zomato’s recent fund raises of USD 50 million”. Upon completion of the allotment of shares, Info Edge’s aggregate investment in Zomato will be about Rs 484 crore. As the website was launched, it became popular soon and expanded rapidly, covering many important regions of India including Kolkata, Mumbai, Bengaluru and Pune by the year 2010. Apart from being a service provider within India, Zomato.com now has branched to overseas in the regions of Philippines, New Zealand, Qatar, South Africa, Sri Lanka, the United Arab Emirates and the UK as well. The website covers a list of over 1, 20,000 restaurants across all these regions catering to more than 15 million customers worldwide. With its headquarter in New Delhi, Zomato.com is providing career opportunity to over 350 employees all across the globe. 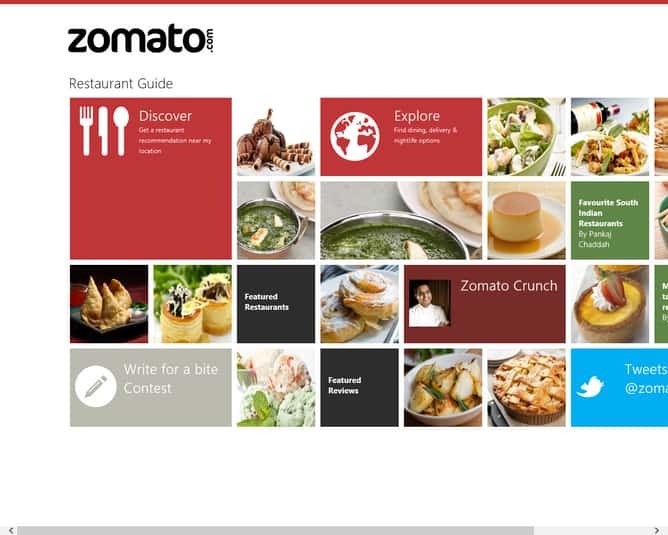 Zomato uses different platforms to engage their customers with them. There is a huge engagement of customers on Facebook. Zomato has more than 600k strong Facebook community. Twitter is a place where Zomato is sparkling. It has more than 114 k followers there. Used as a conversation platform with the customers, Zomato is doing a great job in engaging their customers on their page. They answers all the queries raised over the platform by the customers. Sharing and updating with all the latest updates is a key point for any organization. Zomato uses their blog as their mouthpiece to share all the latest updates. The platform shares the food experience with great content to attract their customers. The company needs to do a lot of job to make its followers on this platform which will certainly work in their promotion. This platform lets the user share the foodie photographs just by sharing it using the tag # Zomato. The image automatically gets shared on the microsite. The key factor for Zomato success is its marketing strategy and in-depth knowledge of their competitors. Zomato aims to be a place where the foodies hangout. The company has spread in 20 countries with its headquarter in New Delhi, India providing service to over 35 million values customers per month. The list of registered restaurants on the website has increased to 384,100 till March 2015. Facebook, Twitter and Pinterest are the 3 main platforms which made the base for the success of Zomato with a deep presence among their customers. Other than that, Zomato has extensively invested a lot over SMO’s, SEO’s and has worked a lot to improve its UI and make it more user interactive. Side by side with a goal to branch globally, they also invest much on TV ads to bombinate Zomato. Pankaj Chaddah, the co-founder of Zomato agreed, “ads on the mobile app have changed the revenue game for them”. More than 50% of their total traffic comes from their mobile apps. “Using location-based services to target ads around a consumer’s physical location helps make this decision easier” said Chaddah. Sanjeev Bikchandani, co-founder of Info Edge and Zomato’s largest shareholder said, “the firm will focus on segments such as online food ordering, restaurant booking, subscription-based services and billing inside of restaurants”.